Like an heiress settling in for her weekly spa ministrations, Georgia, a white Standard Poodle, stands stock-still and holds her muzzle high while the clippers skim her coat, forming the round “rosettes” on her knobby hips. Because of its density, a poodle’s fur lends itself to shaping and sculpting, so when the primping is complete, Georgia looks like a fantastical topiary at Versailles — a bouquet of pompoms on stems. Just add a diamond-studded collar and Westminster ribbon. “This cut is called the ‘Continental’ and gets used a lot in shows,” said the man with the clippers, Larry Hulsey, after rewarding Georgia with a gluten-free treat at Showtime Pet Grooming in north Macon. If you assume this lace doily of a dog will be claimed by an equally froufrou Cotton Belt socialite, guess again. A sort of in-house floor-model as well as pampered pet, Georgia belongs to Hulsey, who at first glance looks more like a coonhound or Rottweiler kind of guy. He operates Showtime as a family enterprise with his 27-year-old son, Kyle. Meticulous, detail-oriented perfectionists who insist on the “scissor finish,” the Hulseys take pride in their award-winning work, but they also represent a different breed of canine aesthetician. They wear leather and ride motorcycles to work, and with their “long-haired country boy” ponytails; mellow, porch-swing manners; and Middle Georgia drawls, these alpha-dog groomers might have stepped off the cover of an Allman Brothers album. Where tattoos meet Shih-Tzus, Showtime is perhaps the South’s only biker-operated beauty parlor for dogs and academy for aspiring pet beauticians. The consistently fun and incongruous visuals that arise at the salon on Forsyth Road – tough guys tenderly tying bows around the topknots of teacup yappers – have proved an effective selling point, both to the midstate’s gentry and its animal-loving hipsters. However, there is more to Showtime than the novelty of its proprietors, who bring a trained skill set and unusual comfort level to highstrung clients – not just the dogs, but their owners as well. 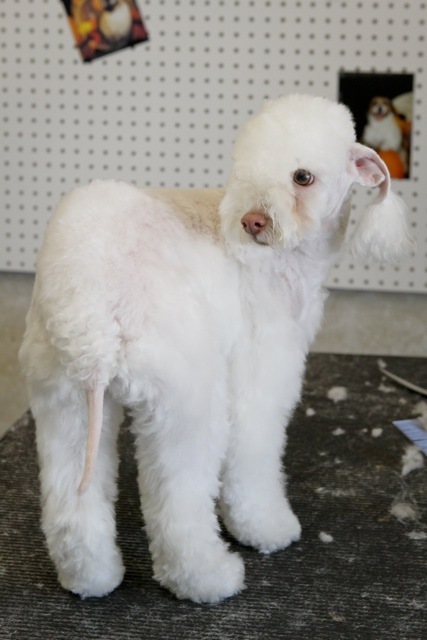 The Hulseys serve as the region’s only “Certified Master of All Breeds” stylists. 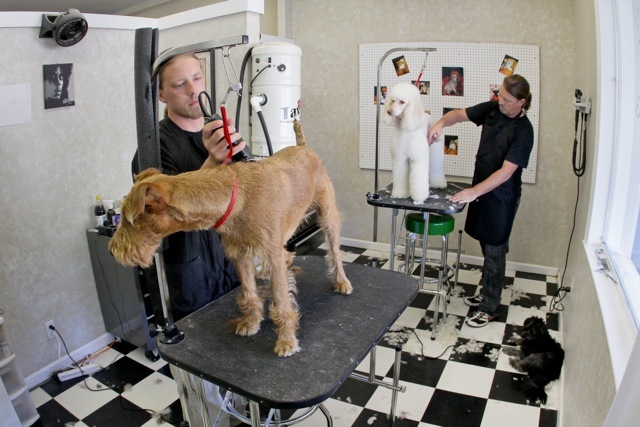 Hulsey was dismayed by the lack of standardization, regulation, and certification in the pet grooming industry. “Anybody with a set of clippers can hang out a shingle and start charging to work on animals,” he said, shaking his head. So he relocated temporarily to Knoxville to study at the Concord School of Pet Grooming, which is accredited by the Tennessee Higher Education Commission, and then he trained his son. They since have won numerous grooming and styling competitions and seldom place outside the top three. “We haven’t had any requests yet for the kind of feather hair extensions that are popular with people these days, but if we do, I’m prepared,” said London, who used to work as a hairstylist for people. Hulsey was not quite sure what to expect when he set up shop during an economic downturn, in the heart of Georgia. Among his favorites is the Bedlington terrier, whose sheep-like appearance can be exaggerated dramatically with a “lamb cut.” As if on cue, a Bedlington prances gamely into the lobby of Showtime, looking like an odd, ambiguous bundle of wool. This sort of inter-species drag is popular. “We can groom them to look like lions, peacocks, camels, whatever,” Hulsey said. “Look at this – now talk about a lot of work,” he added, pointing to a photo of a dog primped and dyed to look like a Teenage Mutant Ninja Turtle. Showtime’s specialized services include “hand stripping,” a razor technique used on schnauzers for the show ring (the effect is similar to flat-ironing). “Boy, you can really tell when a schnauzer hasn’t been cut correctly because a lot of people won’t scissor the hair to blend it,” Hulsey said. “Pawdicures” with shea butter and a variety of spa treatments, including aromatherapy mud masques with lavender, mint, and chamomile soothe and detoxify itchy, scaly skin and remove “tear stains” from beards. As London massages a creamy concoction all over a well-fed Chihuahua named Bella, the dog’s plump body slackens and her eyes grow heavy-lidded with bliss. Finally, Bella gazes up at the humans around her with melting gratitude.